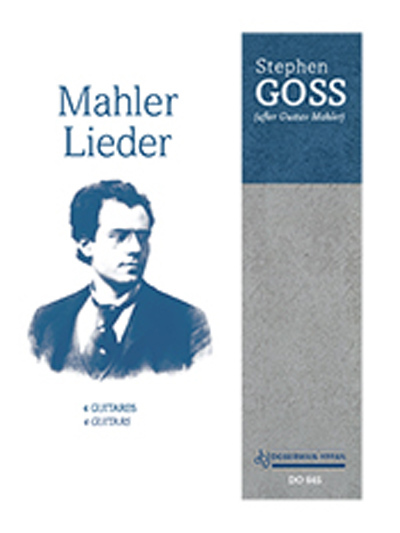 Mahler Lieder is a suite of arrangements and reworkings of songs and symphony movements by Gustav Mahler (1860-1911). Rather than making straight transcriptions, Stephen Goss transforms the music to suit the idiom of four guitars, drawing on some of the implicit influences on Mahler’s work. In Von der Jugend, Steve makes the most of the Far Eastern flavour of Mahler’s score by imitating the plucked string instruments of Japan and China – koto, guzheng, and pipa. The Waltz and Ländler draw on the folk music of Bohemia, which slips effortlessly onto the open tuning of the guitar, and in Ich atmet’ einen linden Duft, Steve attempts to capture the delicate fragrance of the lime described in the song with a fragile campanella texture. The sardonic Des Antonius von Padua Fischpredigt is reharmonised and decorated with rasgueados, and Um Mitternacht is left sparse and spare to evoke the desolation of Rückert’s poem. Mahler Lieder was commissioned by the International Mahler Centenary Conference, UK (IMCC), and the Brno International Guitar Festival, Czech Republic for the Tetra Guitar Quartet. The first performance took place at the IMCC on 8th July 2011. The work has been recorded by Tetra on the album About Time (BGS 2013). Mahler Lieder is dedicated to the memory of former Tetra member Richard Hand (1960-2011).